This was shipped in a corrugated carton, plus was also in a lovely white gift box with a label belted around it! I have another one from a competitor but it has a black top, and in the bathroom with talcum powder flying around, its always showing dust. I love that this lid is stainless like the body.The pedal and back hinge each stick out an inch from the 8wx11h cylinder can, so total depth is 10. Hinge has a pivoting stainless handle on it too.The removable bucket enables tucking the edges of a liner bag inside. The brim of the inner bucket is exposed between the lid and body, so a little bag shows along the edge, but is much nicer than the entire flap hanging out. Smaller size cans like this that are used in baths, offices and bedrooms, dont necessarily need a bag, so this full inner bucket design works well for bagless use too. The handled bucket is easily removed to dump the litter into the garbage thats going out, and can be washed as needed. The area Id ask to improve is to put more substantial/sticky rubber on the bottom because it moves back with every foot press, and its not always wanted up against a wall. I wish it would stay put.Good can. Home territory searches the web to find the best prices and availability on Trash Cans and related products foir your home like Honey Can Do 1.3 Gallon Round Step Trash Can, Stainless Steel. For this page, related items include products we find that match the following keywords: "Trash Can|Garbage Can|Trash Bin" at our vendor partner Walmart - Click More Info / Buy Now to check for price rollbacks!. 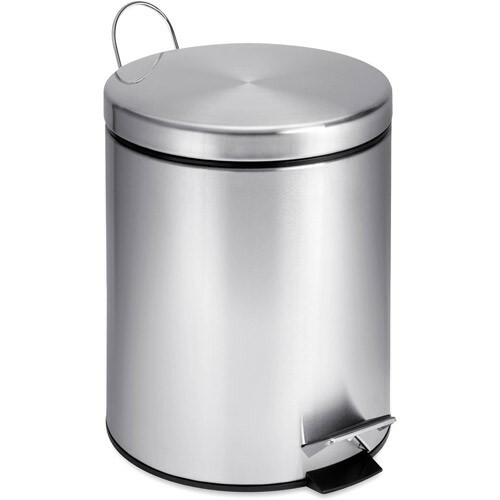 Honey Can Do 1.3 Gallon Round Step Trash Can, Stainless Steel is one of 49 Trash Cans and related products available for sale through HomeTerritory.com, If you have any questions on this product, please give us a call at 734-971-1210 during the hours of 9am - 5pm EST for assistance. Thank you for shopping at Home Territory, the home furnishings superstore!